Kane Russell Coleman Logan has been recognized among the “Best Law Firms” in America by U.S. News & World Report in several practice areas, including Bankruptcy and Creditors Rights, Bankruptcy Litigation, Insurance Law, Real Estate Law, and Commercial Litigation. We are proud to be recognized on the Best Law Firms list again this year because it’s a testament to how much our clients and colleagues value and respect our work in the legal industry. Kane Russell Coleman Logan has been recognized as a top-tier firm by U.S. News & World Report and Best Lawyers. The firm was ranked in the annual list of “Best Law Firms” in multiple practice areas. The U.S. News "Best Law Firms" rigorous evaluation process selects firms that are consistently recognized by clients and peers as law firms that have a preeminent national presence. Clients rate firms on experience, responsiveness, understanding of a business and its needs, cost-effectiveness, civility, and whether they would refer another client to the firm. For the 2018 edition of the list, Kane Russell Coleman Logan was nationally ranked for Bankruptcy and Creditors Rights (Tier 3). The firm was also recognized regionally with Metropolitan rankings for Bankruptcy and Creditors Rights (Tier 1), Bankruptcy Litigation (Tier 1), Insurance Law (Tier 2), Real Estate Law (Tier 2), and Commercial Litigation (Tier 3). “We are proud to be recognized on the Best Law Firms list again this year because it’s a testament to how much our clients and colleagues value and respect our work in the legal industry,” said Joe Coleman, managing director of the firm. 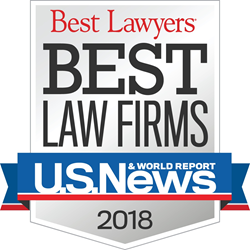 "Best Law Firms" rankings are determined by client and lawyer evaluations, peer reviews from leading attorneys in their field, and reviews of additional information provided by law firms as part of the formal submission process. To qualify, a law firm must have at least one lawyer listed in the current edition of The Best Lawyers in America© list for that region and practice area. Rankings will be printed in the Eighth Edition of "Best Law Firms" and in the Fourth Annual "Legal Issue." Kane Russell Coleman Logan is a full-service law firm with offices in Dallas and Houston. Formed in 1992 with five lawyers, today KRCL is celebrating its 25th Anniversary with more than 80 attorneys employed by the firm. The Firm provides professional services for clients ranging from Fortune 500 companies to medium-sized public and private companies to entrepreneurs. KRCL handles transactional, litigation and bankruptcy matters in Texas and throughout the country.